Crestview’s Javin Etzler will be playing for Miami (Ohio) beginning next season. CONVOY – Javin Etzler, who is The Lima News boys basketball Dream Team Player of the Year, did what many people had predicted when he led Crestview to a Division IV state championship this year. But last summer he did the unexpected when he decided to play football for the Knights for the first time since he was a freshman. At a stage in his career when most players with NCAA Division I basketball offers on the table who also play football step away from that sport, he jumped back into it. Etzler and his very talented friends reached the regional championship game in football, then cut down the nets at the state basketball tournament two weeks ago after beating Berlin Hiland 58-38 in the state championship game. 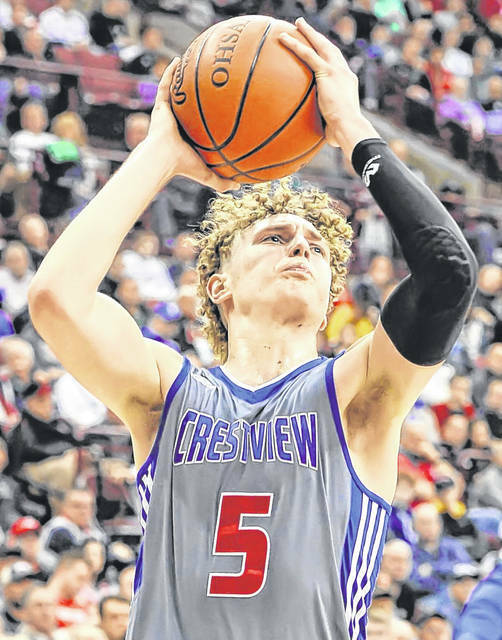 Etzler, who averaged 14.2 points a game and was first-team All-Ohio this season, and his 6-8 sophomore brother Kalen have drawn recruiters to Crestview since they emerged as major college prospects on the AAU circuit before they even got to high school. Javin Etzler, a 6-7 player who hit 50 3-pointers this season, signed with Miami (Ohio) in November. “The very first high school game he played as a freshman, Purdue was here to watch him play,” Crestview coach Jeremy Best said. “That kind of set the table for the next four years. That was something the typical high school player around here doesn’t have to contend with. “He made everybody else feel like a part of what he was going through. All his teammates, he was their buddy, he was their friend. Guys (college coaches) coming in to watch him and some of the things he went through with recruiting never really seeped in to interfere with what we were doing. 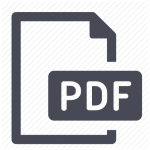 “His maturity process was through the roof as he became a senior and a leader. He probably could have averaged 20 points a game but he was very confident in his teammates and he made his teammates better,” Best said. Etzler stepped up at two critical moments in Crestview’s tournament run. His 3-pointer just before the buzzer in regulation tied the district championship game against Kalida and the Knights went on to win 61-58 in double overtime. The other time was in the second half of Crestview’s 59-49 win over Richmond Heights in its state semifinal game. At halftime the Knights were down 25-23 and Etzler had been held scoreless. But in the second half he scored 25 points to turn the game around. “My coaches and teammates were telling me to keep shooting, to take the shots I take, that they’re going to start falling. Right out of the half we started to go down low so we could draw some fouls and go to the free throw line and that’s kind of how I got going,” Etzler said. Best said, “I think that said a lot about him because we really needed him at that point in time to go into that mode for us, which he had done in games throughout his career. “We really needed him to establish himself in the paint, in the post. That was about the only advantage we had against our opponent in that game and we were finally able to get him there in the second half and, boy, did he take advantage of it,” he said. After graduation, he will head to Miami for summer basketball workouts and to take classes in summer school. “I’ve been lifting and training and trying to get in shape to get ready to go to Miami. I’ve been trying to get in shape so when I get there I’m ready to compete right away,” he said. For now, though, he and the rest of the Crestview community are still celebrating the Knights’ state championship. The other members of the boys Dream Team, along with Etzler, are: Brody Bowman (Temple Christian), Luke Denecker (Bluffton), Josiah Fulcher (Lima Senior), Owen Hiegel (Ottawa-Glandorf), George Mangas (Shawnee), Adam Scott (Wapakoneta), Josh Thorbahn (Ottoville), Jamal Whiteside (Perry) and Jared Wurst (Delphos St. John’s).